Long before B.C. was colonized, Stanley Park was home to Indigenous peoples for nearly 3,000 years, including the Squamish Nation and the Musquem Nation. A stunning collection of intricately carved totem poles at Brockton Point draw crowds, and the Squamish Nation longhouse village of Chayhoos is commemorated on a plaque east of Prospect Point. From here, visitors can continue on to Siwash Rock, a towering, volcanic formation separated from the Seawall by several meters of water. Also called Skalsh or Slhx̱i7lsh, according to coastal history, the 18-metre-tall rock was formed when three brothers transformed a fisherman into the rock as a reward for unselfishness. Vancouver’s pride and joy, this globally recognized aquarium in the heart of Stanley Park features hundreds of permanent and visiting exhibits about our marine world. The state-of-the-art facility offers interactive whale and porpoise shows, a B.C. ecosystem tank, touch pools and a tropical solarium, which one can wander through in hopes of spotting the aquarium’s beloved resident sloth. Open 365 days a year, the aquarium is a sanctuary for those who are interested in learning about preserving our oceans, and makes an ideal rainy day activity. Stanley Park’s three spectacular public beaches – First Beach, Second Beach and Third Beach – all offer something different. 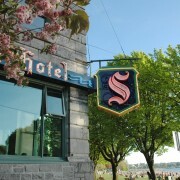 Located at the busy intersection between Davie and Beach Avenue, First Beach (more commonly known as English Bay), is the most urban of the three, and best suited to picnics and stargazing. Second Beach is family-friendly, with a public pool, lifeguard and waterpark. Third Beach attracts a young and eclectic crowd, and is ideal for experienced swimmers (there’s no lifeguard here). All beaches have parking and are accessible by bus and bike. A stone’s throw from the downtown core, this 18-hole pitch and putt is a perfect group activity for a sunny summer’s day, and only costs about $12 per person. Highlights of the course include a spectacular rhododendron garden, views of English Bay and Second Beach, and a perimeter of 100-year-old trees, and beautifully sculpted fairways. During summer months, crowds of all ages come together to view iconic movies on the big screen at the Grand Lawn at Ceperly Park, adjacent to Second Beach. Tickets for Summer Cinema in the park are about $20, and range from Disney classics like The Little Mermaid to cult indie hits such as Napoleon Dynamite. Seating is casual, and viewers are encouraged to spread out a blanket with their own food or purchase a Dinner and a Movie ticket, which includes VIP seating and a reservation at a local restaurant. Each year from early October through to Halloween, the Stanley Park Miniature Train gets a spooky face-lift, becoming The Ghost Train, which takes riders on an eerie, theatrical journey through the woods, rain or shine, daytime and evening. Afterward, fun, lighthearted activities provide respite from the fearsome with a mariachi band and rotating installations inside The Spooky Barn, open during the day ’til 5:00 pm, and in the evening from 5:30 to 10:00 pm. Cyclists, rollerbladers, long-boarders, walkers and runners alike adore exercising along this 10-kilometre pedestrian and cycling path. 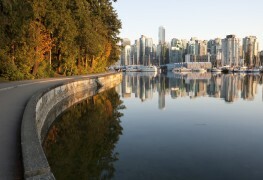 Starting at Canada Place, Vancouver’s world-famous Seawall – divided between walkers and wheelers – winds all the way around Stanley Park’s perimeter, with rest stops at Siwash Rock, the Lions Gate Bridge, and picturesque Lighthouse Point, to name a few. Tip for visitors: bike shops on nearby Deman Street rent cruisers and other modes of transport for reasonable hourly rates. 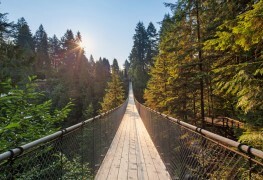 Inside Stanley Park, a dozens of forested trails are fit for beginner hikers, and lead to fascinating points of interest. Highlights include Beaver Lake, a wildlife sanctuary for beavers and other creatures; Lost Lagoon, a 41-acre freshwater lake where swans and ducks gather; and the Seven Sisters, the former site of six old-growth trees, which inspired artists such as famous Canadian poet Pauline Johnson. In the 1960s, the decaying trees were removed to preserve the safety of hikers, but their stumps remain in memory of such spectacular giants. 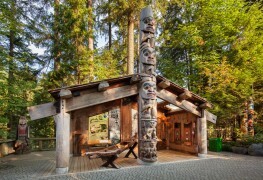 Vancouver’s only ecology center, the Stanley Park Nature House provides historical and ecological exhibits about the park’s many animals, plants and human inhabitants. Nature guides are there to answer your questions about exhibits that range from taxidermy beavers to Indigenous crafts and tools – and admission is free for all. The ecology centre is open from Tuesday to Sunday during summer months, and on weekends during winter and springtime. Step back in time while riding through this historic park in an authentic horse-drawn carriage. Aboard elaborately painted, antique covered-carriages, knowledgeable tour guides tell of the park’s rich natural and urban history as their groomed horses take riders past by monuments such as the S.S. Empress of Japan Figurehead and the famous Girl in a Wet Suit statue. Group tours and private tours are available. Don’t forget to bring your camera!